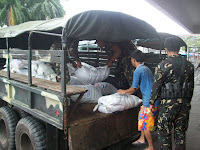 The Armed Forces of the Philippines’ 402nd Brigade has partnered with 30 Infantry Battalion and GMA Kapuso Foundation in distributing relief goods to flood victims last Saturday, February 5. Accordingly, 833 families received the said relief goods in the municipality of Malimono, itemized as follows: barangay Bunyasan – 247 families, barangay Binucuran – 309 families, and barangay Cagtinae - 277 families. Also, a total of 44 families from barangay Oslao of the municipality of San Francisco received relief assistance. The troops, who eagerly worked with the LGUs, other government agencies and NGOs, brought some relief and comfort to the suffering residents of the affected areas. Meanwhile, Philippine National Red Cross (PNRC) Coordinator Marilou Talingting revealed that her office is also helping hundreds of families of the most heavily affected flood communities in the entire province. Talingting said 269 families of barangay Masagad, Malimono are set to receive relief assistance today from PNRC. More relief efforts will also be done Wednesday, Feb. 9, 2011 in the municipality of Mainit with PNRC Chair former senator Richard Gordon. To support provincial government’s flood response, individuals can donate thru the Provincial Disaster Risk Reduction and Management Council (PDRRMC) at the provincial capitol compound.